I remember growing up as an athlete the concept of speed was something that people thought you either had, or didn’t have. I mean at the time a quick look over the playground was all it took to determine whether a kid had the gift of speed, or not. In addition to that the mindset was that if he was the one with it then he would also be the one to always have it. Furthermore the expectation to look for that trait in anyone else was quickly cast aside by the majority. As a strength coach and a lifetime athlete I can tell you that speed is not something that people are solely just born with in their DNA. Speed, like any other physical trait, is also a skill. As a strength coach I’ve had the fortunate opportunity to work with a variety of athletes over the years. However, I’d be lying if I said I didn’t have a favorite “type” of athlete in general that I enjoy training. As a matter of fact my favorite athletes to train (in general) are fighters and military personnel. Sure there are exceptions in every category of athlete, but why is this the case here? The reason is because the primadonna factor drops significantly when compared to other athletic profiles with my experience here. Fighters and military athletes just show up to go to work, period…end of discussion. So today I want to talk about speed development for tactical athletes. I will say upfront that I’m not military myself, but I do understand the importance of being strong, fast, and ready to perform when it matters most. So when it comes to two feet on the ground in the middle of a situation where you’ve got to be fast and decisive in the face of danger I can think of no better scenario for an individual to be at their very best. Speed in the situation I’m referencing here can be your best friend, however many misunderstand what speed is and how to go about optimally obtaining it. To put things in the clear let’s start out by defining speed. Speed is defined as increasing the rate at which an athlete can perform a certain task. Let me break this down further by first covering the 4 types of speed. I’ve listed them out here below. • Acceleration Speed: From stop to go. • Deceleration Speed: From go to stop. • Linear Speed: In a straight line. • Lateral Speed: From side to side. As you can see there are four types of speed areas that we can work to develop concerning your athletic performance. 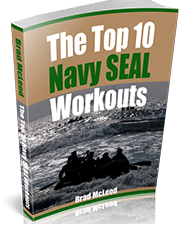 Whether you’re a football player, or your job involves something more tactical in nature these are elements that are still vital and necessary to have for your overall performance. Now to clear up how to develop speed I want to start by stating that strength is at the foundation of speed. Without a foundation of strength we can’t expect to progress in developing more skillful movement, particularly if that movement requires us to perform certain tasks at a faster rate. To give you an example of what I’m talking about here imagine a weak athlete running on a field and then abruptly trying to stop, or change directions. You’ve probably seen this with certain kids in athletic competition. We’ve all witnessed the following scenario…The kid is weak, then abruptly stops to change direction, and either folds up like a tent and hits the ground, or the change of direction is anything but rapid. The whole thing usually just ends up being very sloppy at best. This is an example where strength should be emphasized as the athlete has not yet developed enough strength to stabilize themselves and to build on performing more complex tasks…in a more efficient manner and at a higher rate of velocity. 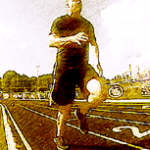 True Speed Training…To Be Fast You’ve Got To Train Fast! Now even though strength should be at the foundation of building speed it is often misused in other areas in terms of its application when trying to build speed. For instance, let’s take a look at the two scenarios I’ve included here below of pulling a sled for the purpose of building speed. You’ve probably witnessed both of these examples with certain other coaches, or trainers during an attempt at trying to train an individual for speed development. Scenario 1: The athlete is attached to a loaded sled with a harness in order to drag the sled for a designated distance. 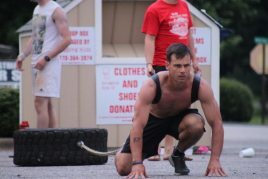 Because of the heavy load placed on the sled the athlete has to dig in with their toes and really work to muscle their way down the running lane in a slow grinding and struggling manner. Scenario 2: The athlete is attached to a loaded sled with a harness in order to drag for a designated distance down a running lane. The sled is loaded with a resistance that is light enough to allow the athlete to rapidly move and progress down the running lane with a natural turnover in his running stride. In the two examples I’ve included here above Scenario 1 makes for a pretty cool strength drill, but it’s NOT a resisted speed drill. There is no rapid production of movement that is specific for the purpose of speed development in this scenario. You see Scenario 2 is a true resisted speed drill because it allows for the athlete to perform movement at a faster pace while still obtaining the benefit of being loaded with resistance. Remember the definition of speed? Plyometrics are another great way to enhance speed and performance. Plyometrics are defined as exercises that produce short burst rapid muscular contractions. Exercises such skipping, bounding, and jumping would include movements that would fall underneath the umbrella of plyometric training. 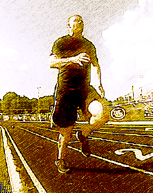 I view plyometrics as sort of a catalyst for speed development. You see when implementing plyometrics we trigger a crazy fast muscle and tendon reaction known as the stretch shortening cycle (SSC). Just think of it like stretching out those muscles and soft tissues like you would a big powerful rubber band and then letting it go to allow all that potential energy to snap back with great force. Plyometrics are what will give us that “pop” or “explosion” for being able to sprint and jump and react faster to the performance stresses we place on our bodies. Triggering the SSC is the key to doing this. The (SSC) training effect we derive from plyometrics allows us to perform speed movements at a higher level while also minimizing the possibility of injury. In terms of developing speed and multi-directional speed plyometrics must be part of the whole equation. In closing true speed training is derived by implementing movements that force us to perform tasks at a higher rate of speed. For the purpose of tactical performance speed development allows for the trainee to be more capable and ready for getting in and out of active situations that require urgency. The elements of speed can be obtained by putting stresses on the body in such a manner that the trainee is still able to perform the given tasks with a high level of control and velocity. This comes from intelligent loading during such tasks and with a sound and smartly applied plyometric training program. All of this should be in addition to a well planned strength program as well. Training smart is the key. If we’re not specific in our training to acquire a specific result then what’s the point? Stay strong and keep training smart! Steve thanks so much for your feedback! I like to introduce some more athletic performance “angles” in my training even when looking at the tactical athletes. Just let us know if you have anymore questions. Thanks again. Good article Brandon…makes a lot of sense! Makes true speed training make sense!! Thanks for the feedback Johnny! Yes, many confuse the elements of speed and how to go about actually developing speed. I figured I would try to clear those up here. Thanks again for letting us know!